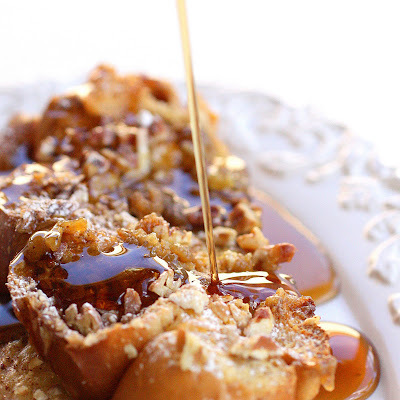 This Overnight French Toast Casserole is an easy breakfast and the perfect amount of sweetness. If you’re looking for a breakfast casserole that will make everyone happy, this Overnight French Toast Casserole is for you! I love gaudy things. I even have a bottle of gold paint that keep on hand to rub accents on picture frames, lamp bases, easels…you name it (a trick my sisters taught me). 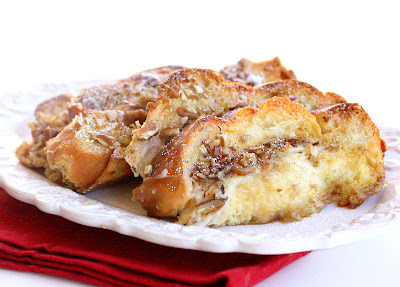 But when it comes to some things, less is more…like this Overnight French Toast Casserole. I have tried several other Baked French Toast casseroles in the past and none of them have done it for me. Paula Deen’s version of baked french toast casserole is decadent and over the top…exactly what I love about her food. But her French Toast Casserole was soggy on bottom and WAY too sweet. It was like eating candy for breakfast. And although I like my sweets…I don’t start devouring them until after noon. 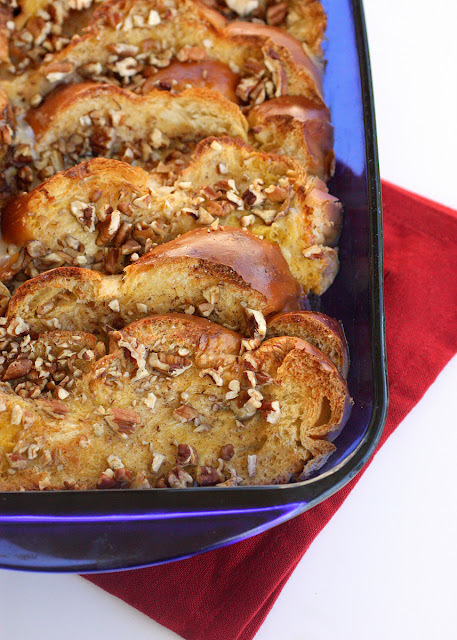 This Overnight French Toast Casserole is simple and elegant. The best part is that it can be prepared the night before and then just popped in the oven in the morning. Because all those people that told me I would become a morning person when I had kids lied to me. Now I’m just grumpy in the morning AND I have kids to witness it. I used challah bread here which really soaks up the sauce but you could use Texas Toast or brioche. It’s simple enough that a little drizzle of maple syrup and a little dusting of powdered sugar compliments it perfectly. In a small bowl combine brown sugar and melted butter and pour on the bottom of a 9x13 baking dish. Arrange slices of bread in the baking dish overlapping if necessary. In the morning, take the casserole out of the fridge for at least 10 minutes while you are preheating your oven to 350°F. Bake casserole for 30-35 minutes. If top starts browning too quickly place a foil loosely over the top of the casserole for the last 10 minutes or so. You want it to cook long enough to make sure the bottom part is cooked but don't dry it out completely. I made this for Christmas breakfast. It was good however if I make it again I would do use more eggs and milk. The top of the bread was a bit dry. I think it should have been more immersed in the liquid ingredients. Sorry you didn’t love it. Maybe try cutting your bread thinner. Made this for a church breakfast, next time I’ll double it…just saying! Looking forward to making this! Quick question, does the recipe use fresh challah/brioche or a day or two old? I’ve had my loaf for a day but it’s still pretty fresh/soft. I just don’t want the dish to become soggy. I always use fresh and it is never soggy! Much respect to the blogger but I am always disappointed in the comments—please rate only when you actually use the recipe & can offer useful feedback. Yes it’s a yummy delish amazing recipe but reviews/comments are meant for all of us looking for input from real live actual users of recipe, not editorial. Sorry but it is what it is. Thanks for the recipe. Made it for a graduation brunch. Doubled the recipe & baked according to my oven. Came out beautiful. Topped with pecans & pistachios, served with a bowl of fresh berries to bring a little freshness to the sweetness. Thanks Vina for speaking the truth. I used brioche loaf, subbed nutmeg for the ginger, and topped it with a maple whipped cream that I created on the fly. SO TASTY. My husband even wants this instead of a birthday cake. Just set this up for tomorrow so breakfast for guests will be easy. I added some dark chocolate chips. Used Trader Joe’s Challah bread (16 oz loaf). Cut bread into ~1” cubes for easier serving at a potluck. Dipped cubes in egg mix to ensure even coating before placing in pan. To me, this casserole looked nicer for the potluck when bread was cut as cubes, filling the pan, rather than slices laid down flat in pan like puzzle pieces. Will try again with slices overlapped but thought egg mixture might pool in bottom half of slices if bread not laid flat in pan. Substituted ground nutmeg for ginger. Made two batches with cubes instead of slices. For 2nd batch, added zest from two tangerines (~3/4 tsp zest loosely packed) and left out nuts. Both were good, but I’ll probably add orange zest in future batches. Sifted a little powdered sugar over top for presentation on batch #1; no powdered sugar on batch #2. The carmelized brown sugar and butter at the bottom adds enough sweetness for us so I’ll omit powdered sugar next time. Baked until knife inserted in casserole came out almost clean without wet bread, ~150-158 degrees measured by cooking thermometer. Loved being able to prepare the night before then just bake the next day! Thanks for sharing this recipe! You’re welcome. Thanks for the heads up. I transferred all of my recipes and some of them transferred wrong. I made this yesterday for Christmas breakfast. This is what French toast is supposed to taste like… unbelievably good. I started making this 3 Christmases ago and now it is our family tradition for Christmas morning! My family cannot get enough of it! Perfect balance of sweetness – thank you!!! Merry Christmas! Made this last night for a brunch today and it came out excellent! Received a lot of compliments. I did not use ginger and added a little nutmeg but otherwise followed the recipe. I loved that it was pretty easy to make and could be prepared mostly the night before.